Nis, Serbia and Montenegro, November 07, 2011 --(PR.com)-- There are millions of Facebook users that browse their profiles as well as the profiles of their friends on their mobile Android mobile devices. Webelinx now offers them the faster and easier way to watch videos shared via this giant social network. This application allows users to create their playlists and watch clips with just a single touch. FB Video Player is an application primarily developed for iPhone and iPod Touch, but now it is available for the users of Android mobile devices. Users will be able to watch all video clips that they friends ever posted or shared, without unnecessary browsing. With this application users can create the playlist of video clips which are posted by them or their friends with just one touch. There will be no need to enter the friend’s profile and then search for videos, the user will be able to watch desired videos directly from his/her home page. Webelinx LLC, based in Nis, Serbia, is a prospective company for high-quality and adequate development of applications for mobile devices. Webelinx also offers wide variety of services from web design to marketing solutions. And from this wide range of services, Webelinx team highlights the development of the first music game for iPhone, called Tap Song, which is a fun way of playing different instruments and singing. For more information about Webelinx team and its products, please visit the company’s web site at http://www.webelinx.com. 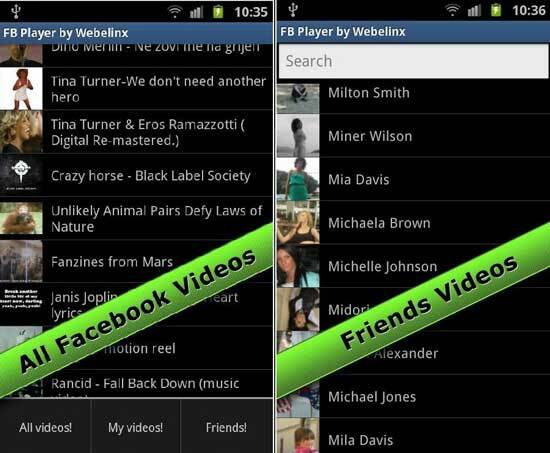 If you would like to know more about FB Video Player for Facebook call them at (+381) 18 45 59 633 or e-mail the admin at webelinx dot com.